I specialize in the repair, restoration and customization of many different instruments from India which are in a different class than those from the West. Most are made from gourds and are very fragile. They have bridges that have to be finely tuned to resonate properly. Most have separate sympathetic strings that resonate when playing the main strings. And the controlled buzzing, or "Jawari," is an art in itself. It takes great patience and knowledge to repair and setup these instruments properly. The old ones are especially worth restoring because modern instrument making has incorporated new machines and computers that have removed the heart and soul that a finely honed luthier adds to an instrument. David has been doing extensive restoration on Indian instruments for ten or more years and repair work on them for twenty-five years. He traveled in India to learn repair techniques in the tradition of the masters. His extensive experience includes restoration and repair on many classical instruments from India, as well as for customers all over the world. Examples of this work include major repairs on Tambouras, Veenas, Sarods, Swarmandalas, and Sitars which had been badly damaged. These were successfully restored and improved beyond their original resonance. His harmonium repair experience is also well respected. He does bellow and air related repairs, changer repairs, action work, sticking notes, and extensive cabinet repairs. He tunes the reeds to A-440, replaces reeds, and completely rebuilds when necessary. David treats his restoration work with the same reverence and respect as the instruments he creates himself. 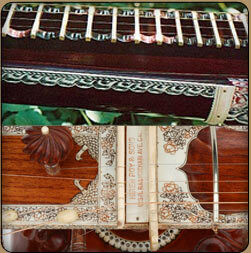 "The harmonium plays beautifully and we can only sit in awe at your expertise and tender care in repairing it. You offered so much, and I am happy to report continued perfect condition a year after your overhaul (we called it "open heart harmonium surgery" didn't we?). There are few if any luthiers who include harmonium repair, and you do it with great finesse. Thank you."